Planning your self-service investments means making decisions across multiple disciplines. 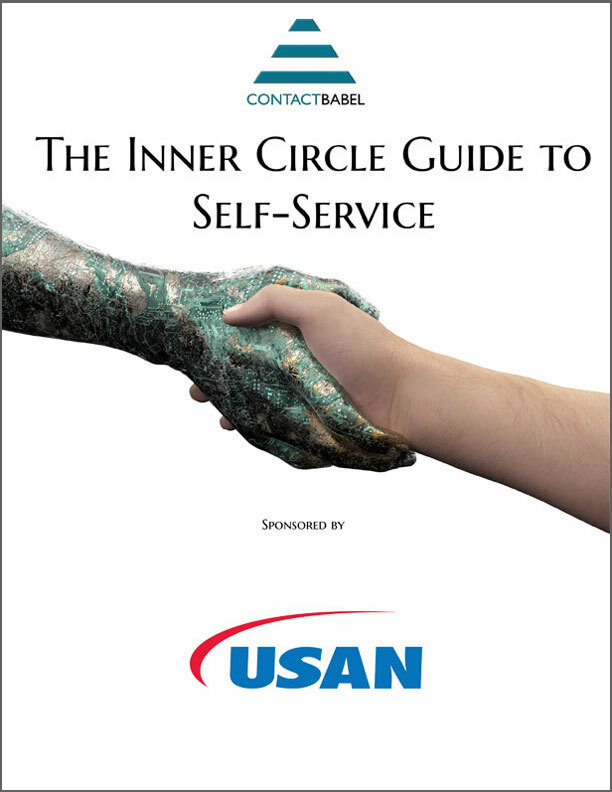 USAN, in association with ContactBabel, has just published a nearly 200-page report on that topic—50 charts deep, covering all the critical topics that make up today’s self-service investment strategy. Those topics include transitioning to self-service, evaluating ROI, defining the costs and complexities of creating a self-service knowledge base—and more. The report has a very straightforward starting point. Involves accessing and modifying structured data. Cost of self-service is lower than person-to-person. Faster and easier for customers to do it themselves. One clear example of this kind of transactional event is password resets. Help desks report that 70% of their calls focus on password issues: the vast majority of those calls can be handled successfully with self-service. Here, person-to-person dialog is required—because of circumstances, regulations, or the customer demands it. The task may be complex but it’s not just cost and complexity that fuels the investment; it’s customer satisfaction as well. No matter the cost, failing to provide the customer the assurance and peace of mind that only comes from talking to another person can damage your brand. Handling complex and/or unstructured issues. Cost of personal contact is lower than self-service. Faster and easier for agents to handle it for the customers. The IRS comes to mind as an example. The cost of creating the secure, compliant self-service infrastructure to handle those complex events far exceeds the cost of having a live agent handle it. So: two buckets. Easy, right? Simply put the transactional events in one bucket and the interactional events in a second bucket and you’ve nailed the first step. Wrong. There’s a third bucket where all those customer events that don’t fall neatly into either of the other two land—and it often fills up fastest of all. It includes customer events that are sometimes transactional, sometimes interactional and sometimes almost both at once. This bucket customer events where the self-service investment and the live agent investment are both in play. That’s the trickiest of the three. And we’ll talk about it more fully next time.